I have been working on handmade clothing lately along with lots (and lots) of help from my lovely mum. 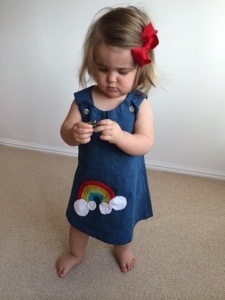 Our first piece was this very cute ‘Rainbow Pinafore Dress’. 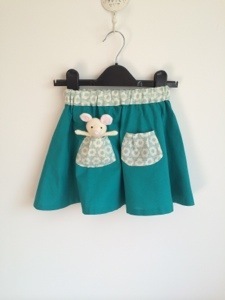 Although the pinafores are very cute they are very fiddly and I really did want to learn the ropes so my mum suggested a lovely elasticated waisted skirt. 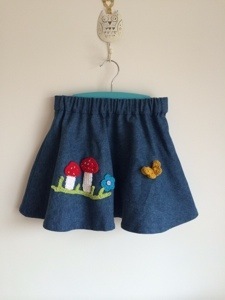 We used the same denim look cotton as the pinafore and a lovely hand crochet toadstool and butterfly appliqués. I think the bright colours of the bamboo cotton crochet works great with the blue of the cotton material. After these makes a started to get excited about making clothes and popped down to my local market to purchase some material. Unfortunately due to my lack of experience I purchased some lovely cream cotton material with a pretty teal pattern but I didn’t purchase enough to make a piece of clothing with. Half a metre looked ample but it wasn’t and I was gutted. It was so pretty but my mum suggested we could use it for pockets on the skirt and I suggested the waistband too. 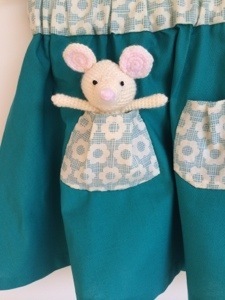 This is the finished piece with a little crochet ‘peek-a-boo’ mouse thrown in for good measure. Don’t forget to visit my Facebook page for more products. I have been very busy over the last few months, lots of new ideas and products and a lovely new nephew to spoil. 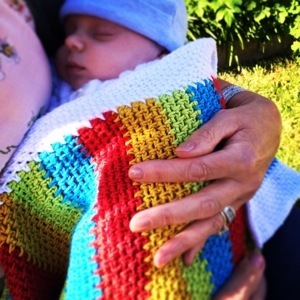 We will start with the little bundle of joy who arrived at the end of March and came home in his lovely bamboo cotton crochet rainbow blanket courtesy of his aunty (that’s me by the way). 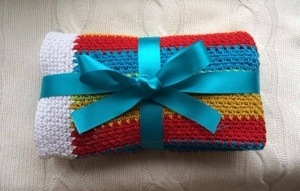 I love this blanket, it is quite weighty but with it being crocheted using super soft bamboo cotton it’s cool for the summer and warm for the winter. 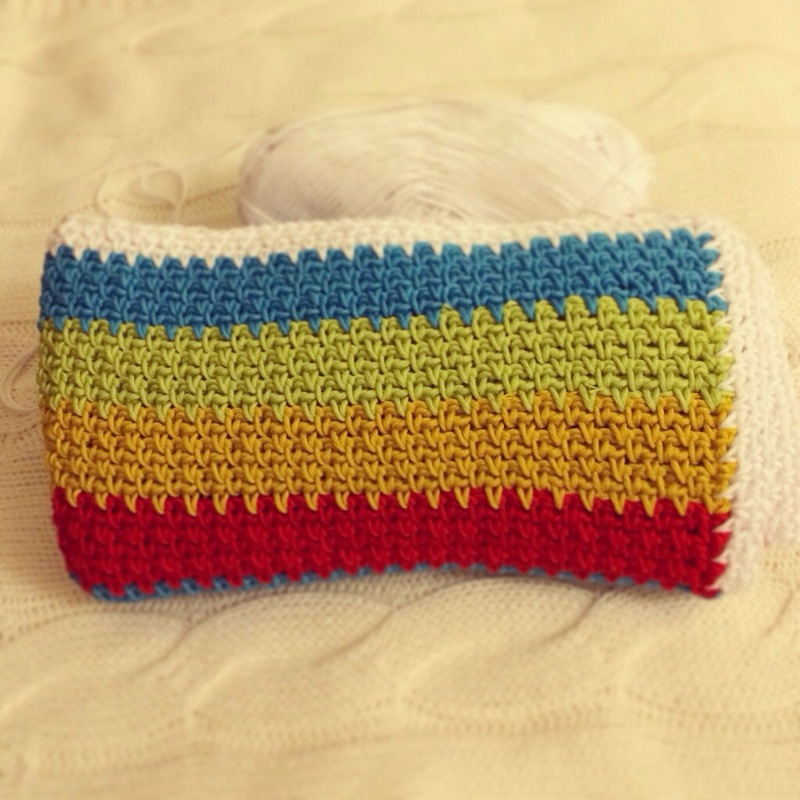 By using only the simplest of stitches, single crochet and chain, I think it is quite stunning in these rainbow colours. I even had enough yarn left to make my nephew a matching toy. I used King Cole DK Bamboo Cotton as they have the widest variety of bright colours I could find. Please don’t forget to check out my Facebook page for other products I have made. With my new little nephew due in less than two months time I needed to get cracking on the blanket that I had promised my sister. I had previously made two blankets, one for my daughter and one for something to do, but these were ideal for winter months as I used acrylic and wool blend yarn. I needed something light and airy as this little boy is going to be a spring/summer baby. So I set to work with researching and browsing the internet for what yarn would be ideal. My two previous blankets had been using dk and chunky yarn and I decided to opt with the dk again as I found this easier and lighter. With the summer bringing heat (hopefully) I thought cotton would be ideal, breathable and lots of stitch definition, but I find 100% cotton to be quite stiff and not really what I wanted for a baby blanket. Then this little beauty crossed my path… King Cole Bamboo Cotton. I am a little bit in love! 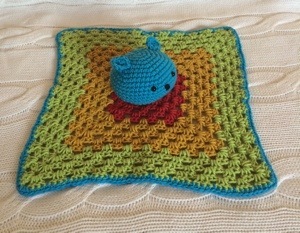 It is so soft, light and available in a variety of colours, especially for a baby. 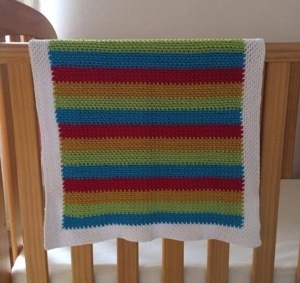 My sister wanted a colourful striped blanket so I went for a ‘rainbow’ theme using red, yellow, green and peacock. I also chose white to finish my blanket off with. 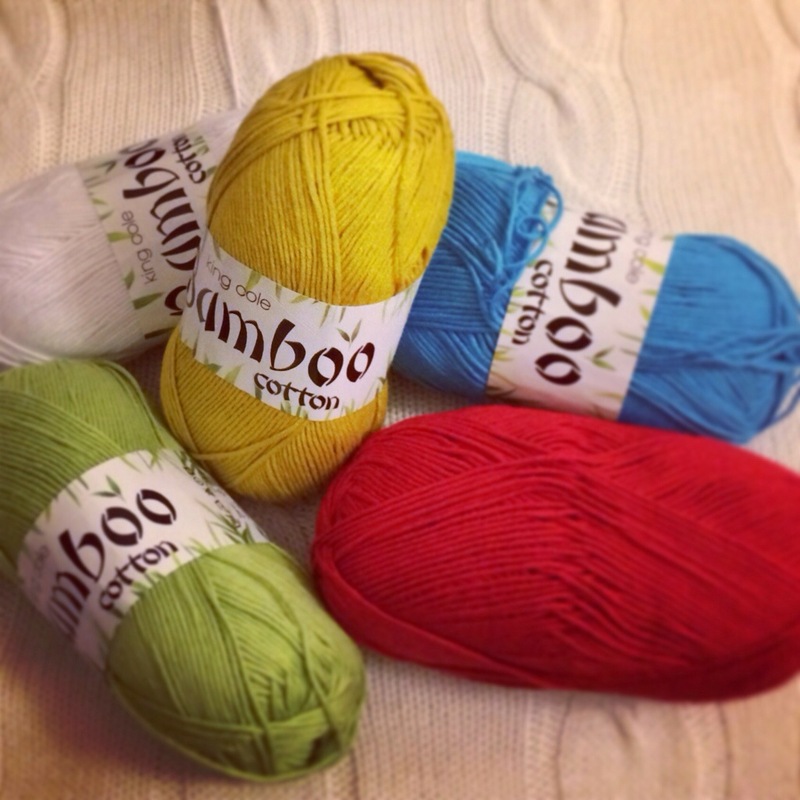 I purchased my King Cole Bamboo Cotton from Minerva Crafts as I found them to be reasonably priced, stock a full range of colours and FREE delivery with orders over £25 (always a bonus). Delivery was also super fast. Here’s a little peek at my (nearly finished) blanket. I think bamboo cotton is definitely the way forward for me and I still have some left it’s just deciding what to make with it (answers on a postcard)!